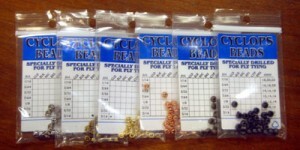 Standard fly tying beads. 24 per pack. Comes on a spool from .010 to .035. 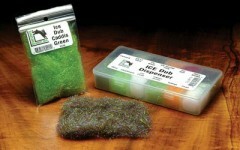 Great for weighting nymphs and streamers. Ultra Wire is a non-tarnishing copper wire. It is available in a tremendous range of colors and sizes. Use Ultra wire for ribbing, weight, flash, wire bodies, and dubbing brushes. A stretchy latex material ideal for backs on scud patterns and more. 1/8 inch wide. Great for wing cases and wrapping bodies. A bright 3-D holographic tinsel! Use for tinsel body streamers like the black nosed dace and muddler minnow. Brightens up flashback nymphs. Great sparkle and dubs beautifully. Very popular dubbing.